For other uses, see Jedburgh (disambiguation). 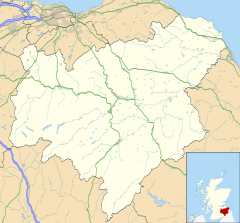 Jedburgh (/ˈdʒɛdbərə/; Scottish Gaelic: Deadard; Scots: Jeddart or Jethart) is a town and former royal burgh in the Scottish Borders and the traditional county town of the historic county of Roxburghshire. Jedburgh lies on the Jed Water, a tributary of the River Teviot. It is 10 miles (16 km) from the border with England, and is dominated by the substantial ruins of Jedburgh Abbey. Other notable buildings in the town include Queen Mary's House, Jedburgh Castle Jail, now a museum, and the Jedburgh Library. Jedburgh began as Jedworð, the "worth" or enclosed settlement on the Jed. Later the more familiar word "burgh" was substituted for this, though the original name survives as Jeddart/Jethart. Bishop Ecgred of Lindisfarne founded a church at Jedburgh in the 9th century, and King David I of Scotland made it a priory between 1118 and 1138, housing Augustinian monks from Beauvais in France. The abbey was founded in 1147, but border wars with England in the 16th century left it a ruin. The deeply religious Scottish king Malcolm IV died at Jedburgh in 1165, aged 24. His death is thought to have been caused by Paget's disease of bone. David I built a castle at Jedburgh, and in 1174 it was one of five fortresses ceded to England. It was an occasional royal residence for the Scots. It was demolished in 1409. In 1258, Jedburgh was a focus of royal attention, with negotiations between Scotland's Alexander III and England's Henry III over the succession to the Scottish throne, leaving the Comyn faction dominant. Alexander III was married to Yolande in the abbey in 1285. Its proximity to England made it subject to raids and skirmishes by both Scottish and English forces but its strategic position also brought the town valuable trade. At various times and at various locations the town supported a horse market, a cattle market, a corn market and a butcher market. Farm workers and servants also attended hiring fairs seeking employment. Mary, Queen of Scots, stayed at a certain house in the town in 1566 and that house is now a museum. The title "Lord of Jedburgh Forest" was granted to George Douglas, 1st Earl of Angus on his marriage to the Princess Mary, daughter of Robert III in 1397. It is a subsidiary title of the present Earl of Angus, the Duke of Hamilton. The Duke of Douglas was raised to the position of Viscount Jedburgh Forest, but he died without an heir in 1761. In 1745, the Jacobite army led by Prince Charles Edward Stuart passed through the town on its way to England, and the Prince also stayed there. The Castle Prison opened in 1823. In 1787, the geologist James Hutton noted what is now known as the Hutton Unconformity at Inchbonny, near Jedburgh. Layers of sedimentary rock which are tilted almost vertically are covered by newer horizontal layers of red sandstone. This was one of the findings that led him to develop his concept of an immensely long geologic time scale with "no vestige of a beginning, no prospect of an end." The Scots name for the town is part of the expression "Jeddart justice" or "Jethart Justice", in which a man was hanged first, and tried afterwards. Several notable people were born in the town, including Rev Dr Thomas Somerville minister of Jedburgh from 1767 to 1830 and his niece, Mary Somerville (1780–1872), the eminent scientist and writer, after whom Somerville College, Oxford is named, and appearing on the Royal Bank of Scotland £10 note from 2017. Others include Conservative MP Michael Ancram in 1945. James Thomson (1700–1748) who wrote "Rule Britannia", was born in Ednam, a village only twelve miles away, but he was educated in Jedburgh. David Brewster, physicist, mathematician, scientist, writer and inventor of the kaleidoscope, was born in Jedburgh in 1781. The popular preacher Rev. Robert Aitken (1800 - 1873) was born in Crailing near Jedburgh. General Sir Bindon Blood was born nearby in 1842. Alexander Jeffrey (F.S.A. Scot.) was a solicitor in the town and was also the county historian. He died in Jedburgh in 1874. The author and broadcaster Lavinia Derwent was born in a farmhouse a few miles outside Jedburgh in 1909. The town's best known rugby sons are the scrum-halves, Roy Laidlaw and Gary Armstrong. Former Scotland rugby team captain Greig Laidlaw also hails from Jedburgh. Douglas Young, fought at Heavyweight at the 1984 Summer Olympics. The abbey is maintained by Historic Scotland and open to the public (there is an entry fee). Many of the more important finds from excavations are displayed on site in the modern visitor centre attached to the Abbey ruins. The Abbey, though much damaged over the years, especially by invasions from England, is still one of the finest late Norman buildings remaining in Scotland. Now roofless, part of the church was used as the parish church into the 19th century. Jedburgh Castle Jail, built in the early 19th century on the site of the medieval castle, is also open to the public. Borders traditions like the annual Callant's Festival and bands of pipes and drums add local colour, and local delicacies include Jethart Snails (boiled sweets in the shape of a snail) and Jethart Pears (the fertile soil of Jedburgh makes it ideal for growing pear trees, and the pear trade was a thriving industry in Jedburgh for centuries. Although most of the pear orchards have now gone, some of the famous Jedburgh pear trees do still remain). Another annual event is the Jethart Hand Ba' game. The Canongate Brig dates from the 16th century, and there are some fine riverside walks. The Capon Oak Tree is reputed to be 2000 years old, and Jedburgh Castle Jail and the town spire are among the town's older buildings. The town's industries included textiles, tanning and glove-making, grain mills, and electrical engineering. Central to the festival and customs associated with the town of Jedburgh are the Jedforest Instrumental Band who support many civic, religious and social events throughout the year, a service provided consistently since 1854. Free Wi-Fi has been provided around the town since the summer of 2008. Although Jedburgh no longer has any rail access it is well located on the road network. The A68 provides direct access to Edinburgh (48 miles (77 km)) and Newcastle-upon-Tyne (58 miles (93 km)). Carlisle is 57 miles (92 km) away and Hawick, Kelso, Selkirk and Galashiels are all within 20 miles (30 km). Jedburgh is known to motorists from the Edinburgh and Newcastle-upon-Tyne areas as Jedburgh is a control town to direct road traffic on the A68. Bus services to Jedburgh are provided by Borders Buses. Until July 2013 they were mostly run by local operator Munro's of Jedburgh. Rugby Union is the sport of choice for this town. The town is home to one of the most famous and oldest Rugby Clubs in Scotland, Jed-Forest. Under-18 "Semi Junior" rugby is played by Jed Thistle at Lothian Park. Also football is represented by Jed Legion FC which currently plays in 'A' League of the Border Amateur League. They play their home matches at Woodend. Ancrum AFC play in the village of Ancrum just to the north at Bridgend Park and include many players from Jedburgh and are in the Border Amateur 'C' League. A Bowling Club is located at Allars Mill. Cricket was once also played at Woodend but the club disbanded in the late 80s. Many sports activities are offered in Jedburgh to children including rugby, football, swimming and badminton amongst others. ^ "Scots Language Centre: Scottish Place Names in Scots". Scotslanguage.com. Retrieved 2013-01-12. ^ May Williamson (1942). "The Non-Celtic Place-Names of the Scottish Border Counties" (PDF). Edinburgh University. pp. 16–17. ^ Scott, W. W. (2004-09-23). Malcolm IV (1141–1165), king of Scots. Oxford Dictionary of National Biography. Oxford University Press. doi:10.1093/ref:odnb/17860. ^ a b Historic Environment Scotland. "CASTLEGATE, JEDBURGH CASTLE OLD JAIL WITH EXERCISE YARD WALLS, FORTIFICATIONS, PORTCULLIS GATES, ENTRANCE GATES AND OUTER EMBANKMENT WALL (Category A) (LB35482)". Retrieved 2019-02-21. ^ Sharon Bennett Connolly (15 September 2017). Heroines of the Medieval World. Amberley Publishing. pp. 116–. ISBN 978-1-4456-6265-7. ^ Olsen, Judy (2003). Old Jedburgh. Catrine, Ayrshire: Stenlake Publishing. p. 3. ISBN 9781840332360. ^ "Mary Queen of Scots House". Jedburgh.org.uk. 2012–2017. Retrieved 2017-09-06. ^ a b American Museum of Natural History (2000). "James Hutton: The Founder of Modern Geology". Earth: Inside and Out. Archived from the original on 2016-03-03. ^ Graphic Design Section (1999). "Border Brains Walks Berwickshire". Scottish Borders Council. Retrieved 2012-06-29. ^ Keith Montgomery (2003). "Siccar Point and Teaching the History of Geology" (PDF). University of Wisconsin. Retrieved 2008-03-26. ^ "Visitor Attractions. Hutton's Unconformity". Jedburgh online. Archived from the original on 2012-02-02. Retrieved 2012-06-29. Whilst visiting Allar's Mill on the Jed Water, Hutton was delighted to see horizontal bands of red sandstone lying 'unconformably' on top of near vertical and folded bands of rock. ^ Trimble, Kim. "The Reivers". www.turnbullclan.com. Retrieved 2018-03-28. ^ "Jedburgh". Jedburgh. 2012-11-29. Retrieved 2013-01-12. ^ "Borders Buses Timetables". Retrieved 2017-07-01. ^ "Munro's of Jedburgh - Home Page". Munrosofjedburgh.co.uk. 2011-08-08. Retrieved 2013-01-12. ^ "Border Amateur Football League ::Border Amateur Football League". Bafl.leaguerepublic.com. Retrieved 2013-01-12. Wikimedia Commons has media related to Jedburgh. This article incorporates text from a publication now in the public domain: Chisholm, Hugh, ed. (1911). "Jedburgh" . Encyclopædia Britannica. 15 (11th ed.). Cambridge University Press. pp. 307–308.